Quick! Think of a vacation or day trip destination near Atlanta. What comes to mind? Six Flags Over Georgia? Zoo Atlanta? Lake Lanier? Well, the Picky Peaches have found a destination you may have missed. Just north of Atlanta, off I-75, there’s a vacation/day trip destination with the charm of a small city. Cartersville, Georgia is home to Red Top Mountain State Park, Lake Allatoona, Tellus Science Museum, Booth Western Art Museum, Bartow History Museum, Barnsley Gardens Resort, Etowah Indian Mounds State Historic Site and more. No matter how long your visit, you’re sure to get hungry. That’s why we want to tell you about a good place to have a nice meal. 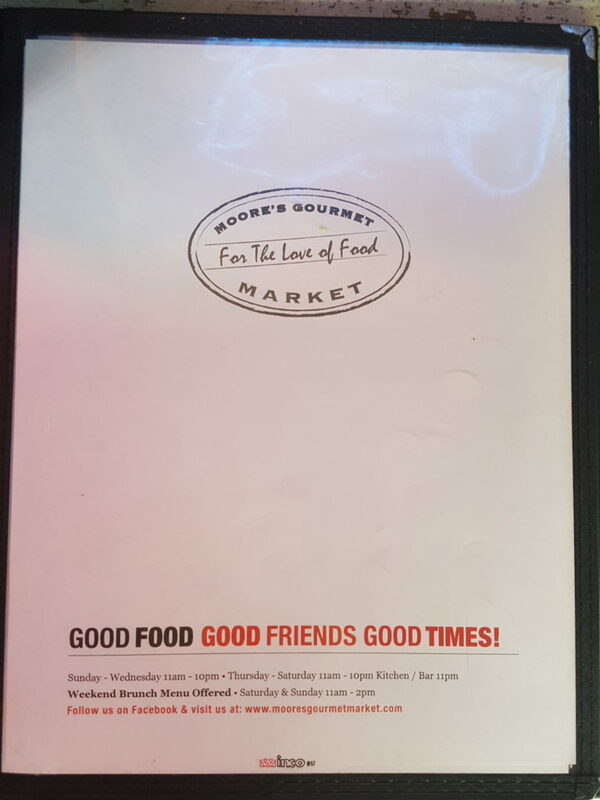 Moore’s Gourmet Market is the 9th stop in the Hidden Gem Restaurant Challenge. Trust your GPS or Waze, when it tells you to turn onto a residential street. 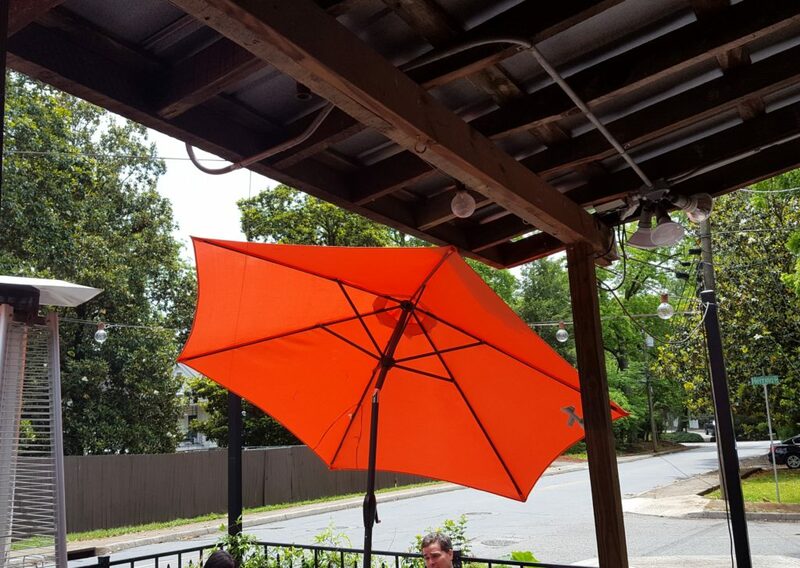 When you see the orange umbrellas and lush greenery out front, you’ve reached your destination. Choose a space in the ample parking lot, then check in with the hostess for inside or outside dining. 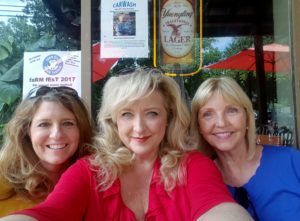 It’s easy to see why their motto is “Good food, good friends, good times.” They’ve managed to successfully meld hip and cozy. The atmosphere is very laid back and the food is so good. The menu is extensive and there’s a focus on quality. For a tropical taste of summer, try the Moore’s Mango Chutney Tuna Salad sandwich served with green leaf lettuce on a croissant. Light and delicious. 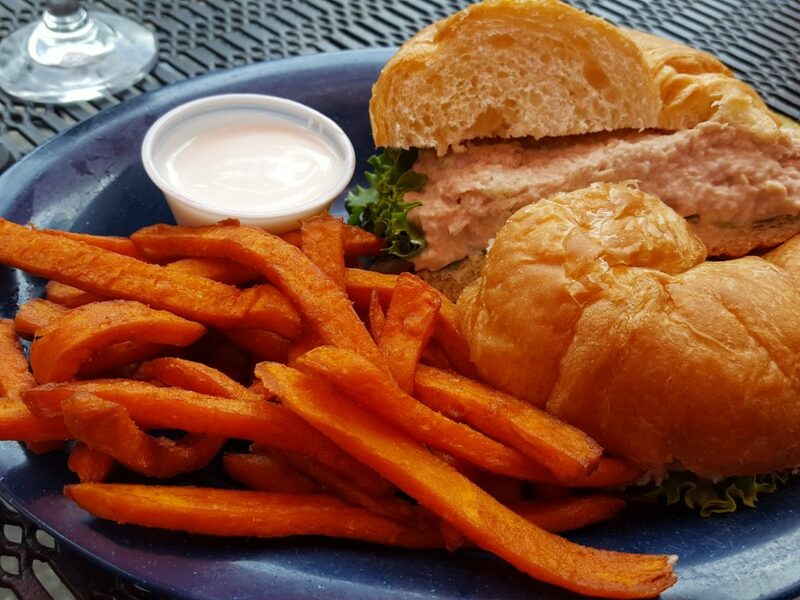 All sandwiches are served with one side and a pickle spear, so we chose sweet potato fries. Imagine our delight when they arrived with a little ramekin of marshmallow fluff for dipping. Divine! 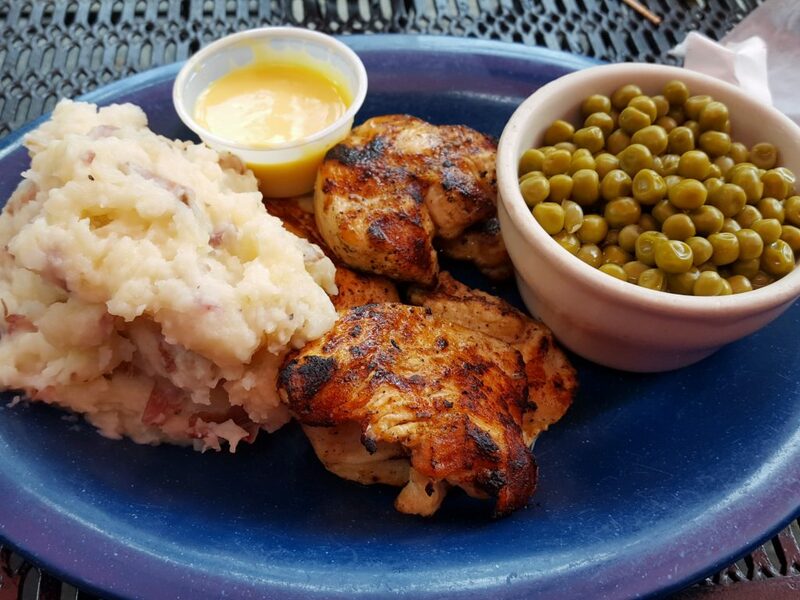 One of the most popular items on the menu is the Moore’s Grilled Chicken Tenders and it’s easy to see why. These golden pieces of goodness are simply grilled with salt, pepper and, we suspect, a little butter. They tasted exactly like the ones P1’s Mama makes, so you know they’re delicious. Whipped red potatoes and fresh English peas made it the perfect Sunday dinner. Be sure to check the big chalkboard for the daily choices. 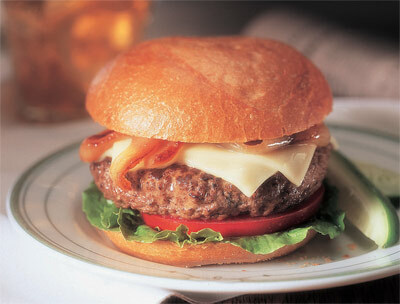 For guaranteed satisfaction for the burger lover, have the 1/2 Pound Moore’s Burger Your Way. Choose from cheddar, provolone, smoked Gouda, pepper jack, Swiss or Bleu cheese. Served with a choice of steak-cut fries, tater tots or fried onion straws. 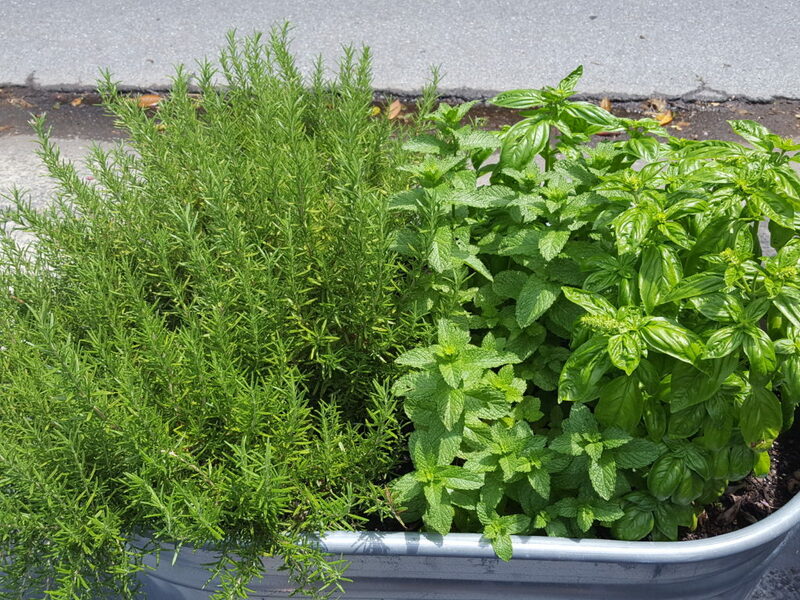 There are lots of side dishes on the menu, so you can feast on a Vegetable Plate. It’s the stuff we all know and love, such as whole kernel corn, pasta salad, green beans, mac and cheese, sautéed squash, shredded cole slaw and red potato salad. 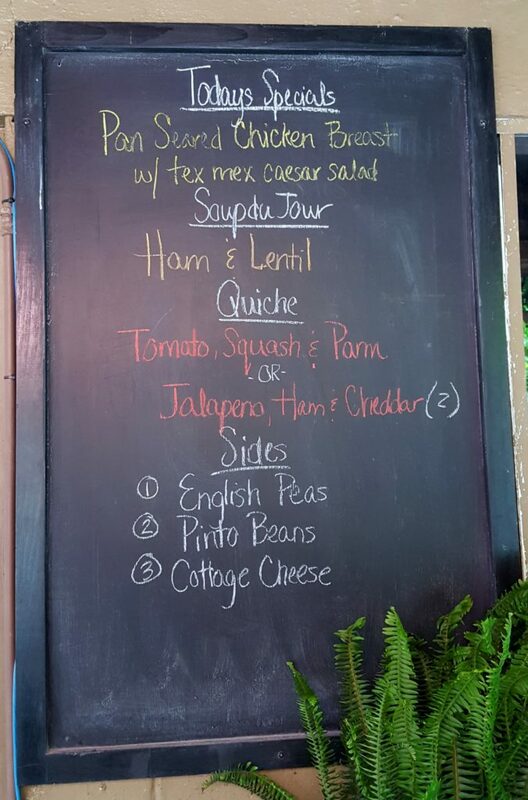 For more side dishes and daily specials, be sure to check the big chalkboard. 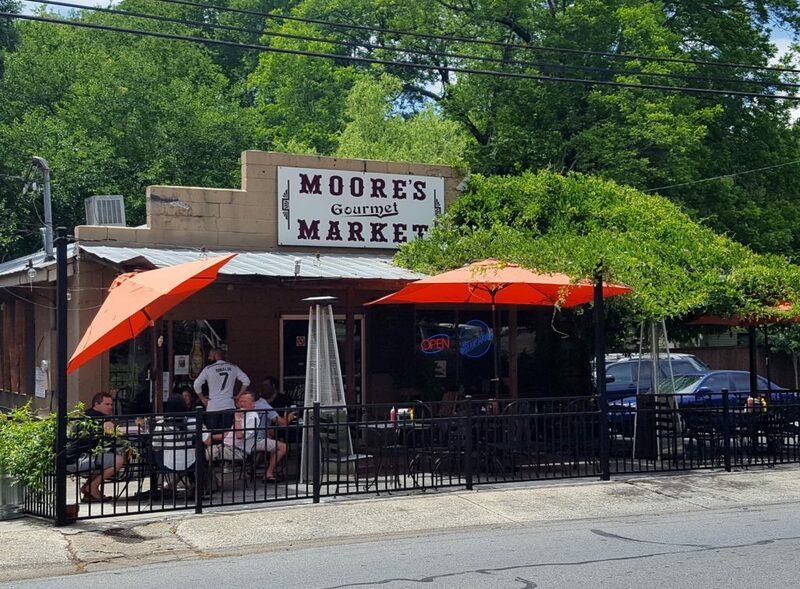 Moore’s Gourmet Market, 227 Fite Street, Cartersville, GA 30120. Hours: Sunday – Wednesday 11:00 a.m. – 10:00 p.m.; Thursday – Saturday 11:00 a.m. – 11:00 p.m. 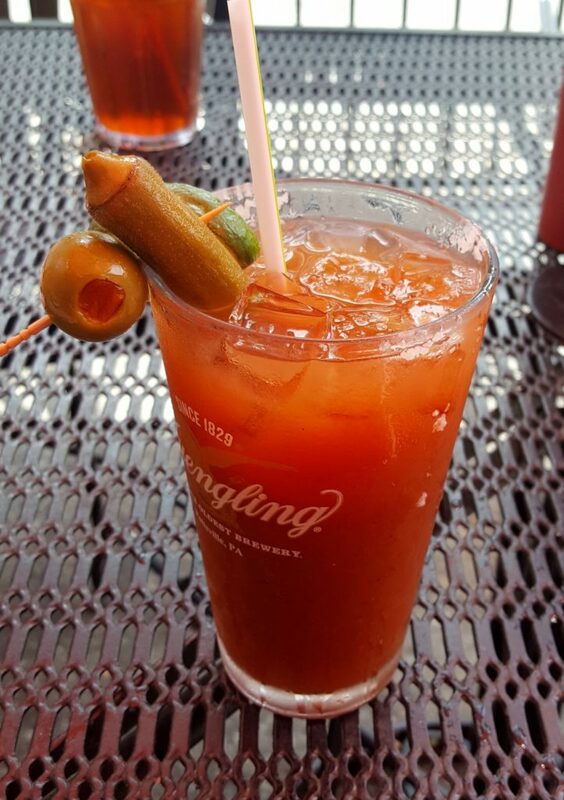 Weekend Brunch Menu Offered: Saturday & Sunday 11:00 a.m. – 2 p.m.
Join us next week for a very impressive place to visit in downtown Cartersville. You’ll be amazed! ← PICKY PEACHES ON THE ROAD #6: Can’t Go To 5th Avenue? Then Try 30Avenue! Fabulous! 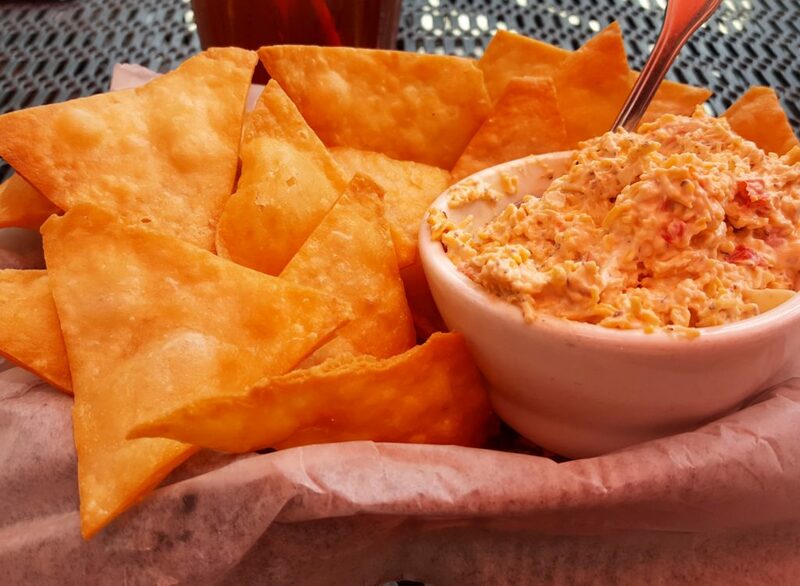 I LOVE the pimento cheese! !